I figured this was the good kick in the you-know-what to get something finished around here. I painted it and after arranging the furniture the best I could, it looked like this for the past 3 1/2 years. But I have always been bothered by the darkness of the space. All the furniture that is in this space was in separate rooms when we lived in Virginia. Both rooms had tall windows with a southern exposure so the dark furniture worked nicely. But here it just felt so blah. All the furnishings were purchased pre-blogging days. But I am not about to get rid of anything so my focus is to reused what I have, to re-invent using paint, new hardware, fabric, and a few accessories. As most of you know we are renting so this is NOT our forever home, so I am making changes that I can take with me. These photos were sent to Anne-Marie from 10 Rooms for a colour consult and after a few emails back and forth we came up with a plan. Here were the inspirational photos that I had sent to her as well to get the ball rolling. 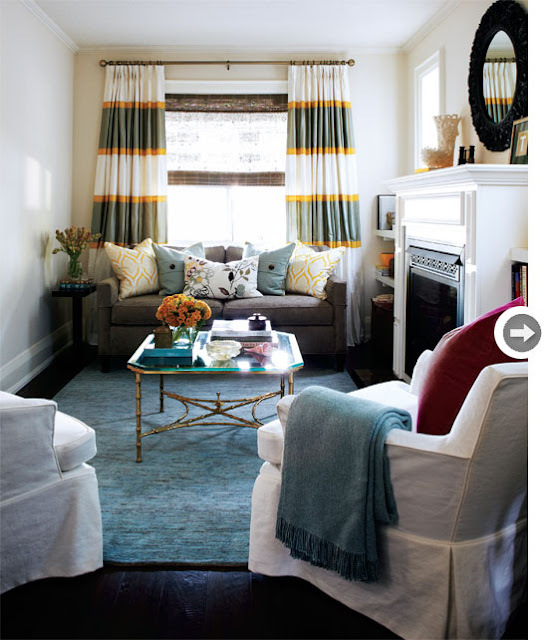 I like the drapes, drapery hardware and mirror in this space. Love the book shelves, ottomans and pops of blue. I am going for a casual yet classic look. Crisp and clean walls, simple accessories and with a few punches of colour! 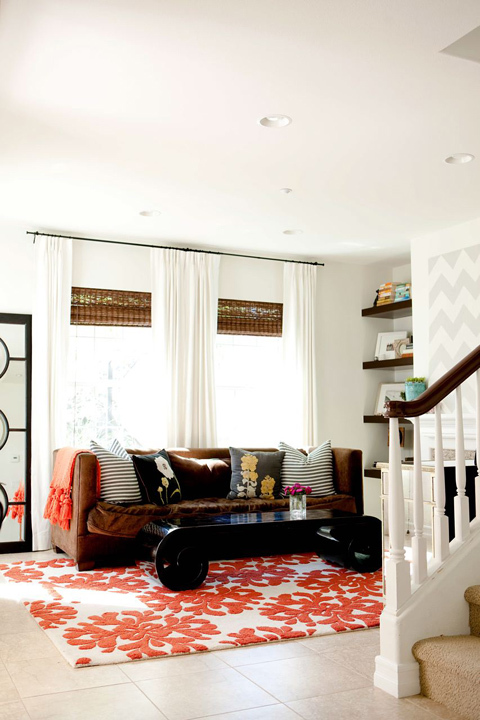 I am also excited to partner with Benjamin Moore that has willingly provided some of the paint for this room makeover! Hope you come back every Wednesday to see updates to the space. Fingers crossed it all gets done in 6 weeks! 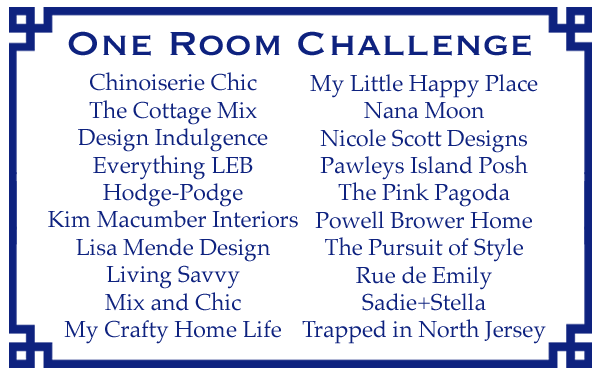 Don't forget to follow along with all these other inspirational bloggers as they join me the challenge to make over a space in six weeks. Hop over to see weeks 2 and week 3 , week 4, week 5 and week 6! can't wait to see this zhushing!!! wow...that is some plan. can't wait to see it! I just pinned those bookshelves...this is going to be good! It's going to look absolutely gorgeous, I'm sure! Wow Barbara, a lot of work ahead, but at least you don't have to buy furniture! Best of luck with your makeover! Where in Virginia did you use to live? We're in Northern VA. west of DC. Looking forward to seeing how you lighten up the space!! It's going to be a fun adventure! 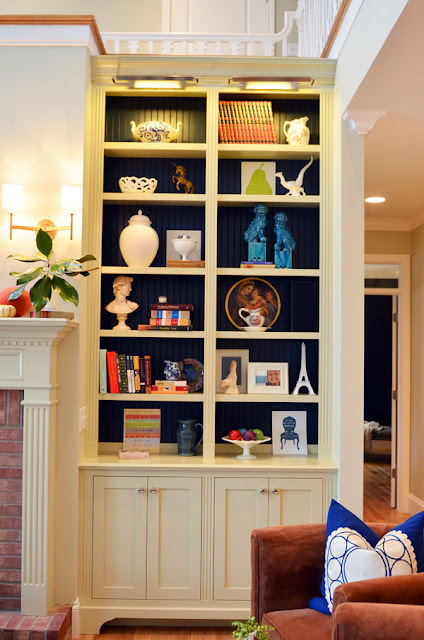 Love the bookshelves and the striped drapes...I am all about a great ZHUSH! That is what I am doing to my living room as well! Good luck! Oh my... you are on a mission! I love your inspiration pics and your list! It is always amazing what you can do with a can of paint! So excited to see the transformation! Love the inspiration. Can't wait to see it all transpire!! That is one impressive to-do list. Can't wait to follow along! Wow! How exciting to be asked to participate in this. What fun! Your current space is already terrific that I can't imagine how awesome the after is going to look. Love your concept images and the colour palette. Good luck Barbara! Can't wait to see! I've JUST started blogging and in the same conundrum...all my dark furniture that used to be fine spread out over 5 rooms is now all in the same room and driving me crazy! :) I, too, won't be buying anything new so it's reinvetion time. Looking forward to following your journey as well. Good luck! What a great challenge and incentive to take action! I find renting is like a bit of a leash...you can only go so far... But the approach you have is proof that you can actually create incredible spaces in spite of that. I like your investment focus being on things you can take with you, and the rest is 'only paint,' as they say. This is so exciting, and I'm looking forward to seeing you work your magic! Go Barb!!! Love your plan and your inspiration photos. I think you are moving in a great direction. Can't wait to see more! This is going to be so cool! I love your inspiration pics- and cannot wait to see your take on them. Good luck, chica! That looks like A LOT of work!! Yay! Love this challenge - it's a great way to ensure a project gets completed. Love the inspiration shots, especially the first one. Good luck! How fun! Can't wait to see the progress - good luck! Funny how things work out, I'm doing a post tomorrow about painting my sideboard too! Great inspiration pics and I do love the pops of color. Look forward to seeing the progress. I love inspiration photo #2...looks a lot like your room! Love your plans to brighten up the space. I need to do the same as soon as I have some updating/reno mojo again. Love all your inspiration pics. That raspberry paint was something else! 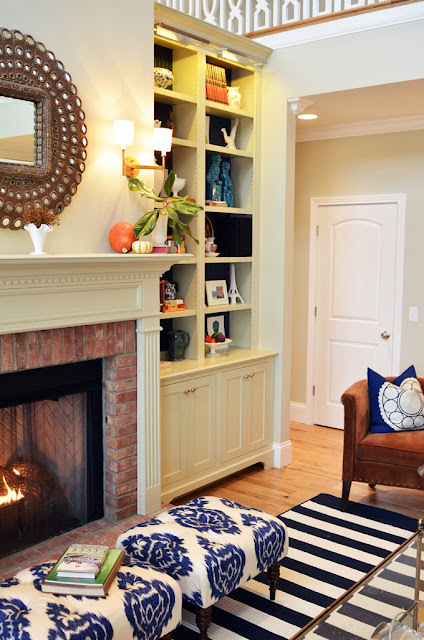 I think you made a huge improvement painting it, but I can see adding a little brightness and freshness to your current space. Can't wait to see the transformation! The pops of color in each of your inspiration pics are all divine. I can't wait to see where you head with your room. Welcome to the One Room Challenge! That is so awesome! The pictures you shared look amazing. Can't wait to see what you do. I am sure it will look amazing. Wow!! Very exciting - can't wait to see your makeover, especially with the theme of keeping your stuff (let's stop being such ridiculous consumers!! )...love the inspiration shots! Amazing inspiration photos! And you have a long list! I'm going to love watching your progress, Barbara! Welcome to the ORC! Before we moved in, our master bedroom (that I am doing for The One Room Challenge now) has a similar red focal wall and it was not calming and restful at all. It's not wonder why you painted them over when you moved in. Your living room already looks good. It only needs a couple of bright accents to freshen them up but I see you have more great plans for the room. Looking forward to see your room's progress next week! Beautiful inspirations, by the way! P/S: I am hosting a fabulous giveaway. So, come by and enter if you like! I cannot wait to see how this turns out. What an overhaul, you're right, so glad we're in this together! 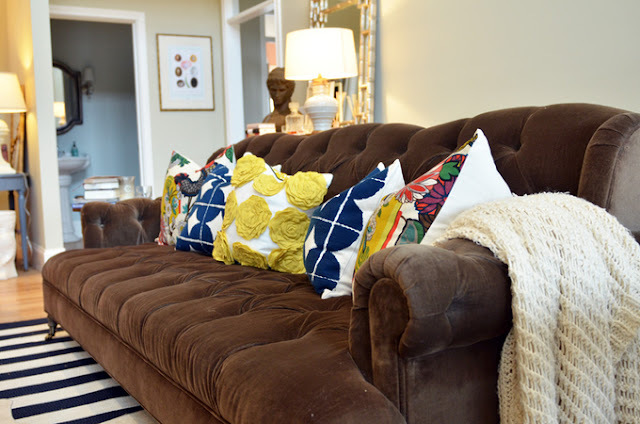 Would love to see more upholstery/fabric in your room, too! Good luck my friend! What a great idea. I'm sure it'll be gorgeous in six weeks time. Anxious to see the results. We are going to have fun aren't we? That's a ton, but wow, will it sizzle when you're done! Wow. That was some raspberry room! You already really improved it, but I know how you feel about "espresso". Looking forward to seeing what you come up with! No doubt, it will be beautiful. Thanks Janis. Yes, the red was a tad overwhelming! wow!! i really like the all images and reviews. i really enjoyed.